Understanding Percutaneous Endoscopic Gastrostomy - Reflux, Stomach Pain, Ulcers - Stephen Severance, M.D. 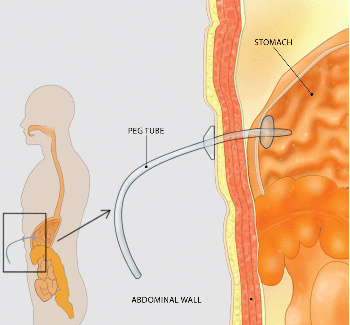 In the PEG procedure, the provider places and secures a feeding tube into the stomach. PEG tubes can last for months or years, but if replacement is required, it is a simple procedure for the provider to remove or replace the tube. Your provider will use a lighted flexible tube called an endoscope to guide the creation of a small opening through the skin of the upper abdomen and directly into the stomach. 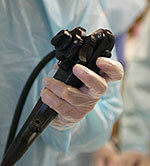 This procedure allows the provider to place and secure a feeding tube into the stomach. Specialized liquid nutrition, as well as fluids, can be given through the PEG tube. If the PEG tube is placed because of swallowing difficulty (e.g., after a stroke), there will still be restrictions on oral intake. Although a few PEG patients may continue to eat or drink after the procedure, this is a very important issue to discuss with your provider. Complications can occur with the PEG placement. Possible complications include pain at the PEG site, leakage of stomach contents around the tube site and dislodgment or malfunction of the tube. Possible complications include infection of the PEG site, aspiration (inhalation of stomach contents into the lungs), bleeding and perforation (an unwanted hole in the bowel wall). Your provider can describe symptoms to watch for that could indicate a possible complication. PEG tubes can last for months or years. However, because they can break down or become clogged over extended periods of time, they might need to be replaced. Your provider can easily remove or replace a tube without sedatives or anesthesia, although your provider might opt to use sedation and endoscopy in some cases. Your provider will remove the tube using firm traction and will either insert a new tube or let the opening close if no replacement is needed. PEG sites close quickly once the tube is removed, so accidental dislodgment requires immediate attention.